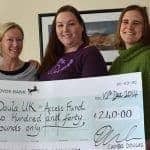 Find a Doula UK registered doula who covers your area by entering the first half of your postcode. You can also leave the postcode box empty and search by just language. Please note that the results are presented in no particular order; the list is simply all those doulas who have said they can cover the postcode district you enter presented in a random order that changes on each refresh or new search. You can read about the services doulas offer here, and example fees here. We provide guidance on hiring a doula here. If you are NOT an individual looking for a doula to hire, please do NOT use the Doula UK Find A Doula directory to spam our members. It will not be appreciated and will only bring your organisation and anything you are trying to promote into disrepute amongst Doula UK members. Instead, please contact us on info@doula.org.uk and we can look at how we can work with you. Thank you!